Prime Minister Narendra Modi arrived on Saturday afternoon in Jaffna, the first Indian premier to set foot in this war ravaged town in Sri Lanka's Tamil-dominated Northern Province, a day after he urged the country's new leaders to give greater autonomy to its Tamil minority. 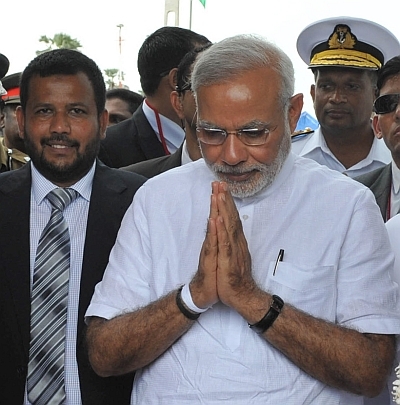 Modi flew to Jaffna by an Indian Air Force chopper after brief visits to the holy town of Anuradhapura where he offered prayers at the sacred Mahabodhi tree and Talaimannar where he flagged off a train service. He is only the second foreign leader to visit the battle-scarred region. British Prime Minister David Cameron had visited Jaffna during a Commonwealth summit in Colombo in November 2013. Jaffna is about 400 km north of Colombo. The prime minister's brief visit is seen as hugely symbolic, particularly after he called on the majority-Sinhalese government to fully implement the 13th amendment, a 1987 constitutional provision on greater autonomy and go beyond it in the reconciliation process. "Sri Lanka has lived through decades of tragic violence and conflict," Modi said on Friday, while making a reference to three decades of bloody ethnic war which killed at least 100,000 people, mostly Tamils. He urged the Sri Lankan government to ensure early and full implementation of the 13th Amendment and to go beyond that when finding a political solution. "We believe that early and full implementation of the 13th Amendment and going beyond it would contribute to this process," Modi said yesterday after summit talks with Sri Lankan President Maithripala Sirisena. India has been pressing Sri Lanka to implement the 13th amendment on devolution of powers in "letter and spirit" and to fulfil the aspirations of the ethnic Tamils. The 13th amendment that followed the Indo-Sri Lankan Accord of July 1987 signed between then Prime Minister Rajiv Gandhi and then Sri Lankan President J R Jayewardene envisaged the devolution of powers to the provinces in the midst of the island's bitter ethnic conflict.